The Legend of Legacy has a pedigree other JRPGs can only wish for with its development team consisting of former Square Enix and Level-5 employees. But given that it comes from a team who had a hand in some of the most popular classic JRPGs of the 90s and beyond, this game is more than a bit of a letdown. When I heard that The Legend of Legacy's writer was Masato Kato—scenario writer for the Final Fantasy and Chrono Trigger series, among many other games—I was more than a little excited to play it. However, The Legend of Legacy has in no way the grand epic plot I was expecting. 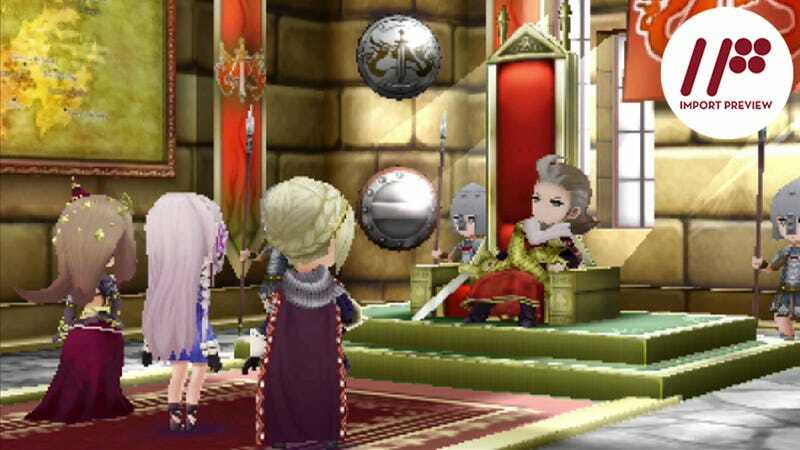 In fact, there is almost no plot in The Legend of Legacy to speak of outside of the first hour of the game. When you start the game you choose one of seven characters as your protagonist—though this does little to affect the game in any way. Then you encounter a few other adventurers on the road (who join your party), do the tutorial area, and meet the ruler of the island. From there, you simply venture out into the ruins spread across the island of Avalon, exploring their mysteries. Each new area you unlock gets a bit of narration the first time you go there and, rarely, you may get a sentence or two out of the characters; but in the twenty hours I spent with the game, that was literally all the story I got. So with practically no story to carry the game, that leaves the gameplay to do all the heavy lifting. The battle system itself is actually rather interesting. Like in Final Fantasy XIII, you assign the characters different roles—in this case attack, defend, or support. Each character’s roles level up in power as they are used and grant the character new skills. At the start of each turn you can change the role setup for your characters, allowing you to change your strategy on the fly. The monsters you randomly encounter in The Legend of Legacy are quite strong. Most can kill your characters in one or two hits—hence the need for a defender. To balance this, you are automatically healed after each battle. Moreover, if a character falls in battle, a normal heal spell brings them right back to life—though with a noticeably lower maximum HP. The downside to this battle system is simple: It is painfully slow. Each creature you battle takes two or three hits to kill. Battles where six or more appear are a battle of attrition as much as anything as you often have one character defending, one healing, and one attacking to survive. Thus battles become monotonous quickly (even with the ability to fast forward battles at 2x speed)—a major problem when the game is practically nothing but. Moreover, leveling up is a grind as well, as individual skills (in addition to roles) only level through repeated use. In other words, nothing happens quickly in The Legend of Legacy. But while The Legend of Legacy lacks in the story department and moves at a slow pace, it will probably still appeal to anyone who likes the idea of a terribly difficult JRPG. As I have talked about in depth before, The Legend of Legacy is unforgiving with its surprise mini-bosses and strong normal enemies. The game is nothing if not challenging. Even using the game's quick save feature constantly, I still died or was forced to reset (as running away from battle returns you to the start of the dungeon) countless times as I played. The Legend of Legacy is a throwback to classic JRPGs but lacks much of what made them so great. The bare-bones plot gives little emotional attachment to the world or characters. While the gameplay is solid, both it and general progression are tediously slow. Challenge is, frankly, the game's only possible redeeming virtue. And that's a real shame given all the potential this game had with its slew of talented creators. The Legend of Legacy was released for the Nintendo 3DS in Japan on January 22, 2015. There is currently no word on an international release.